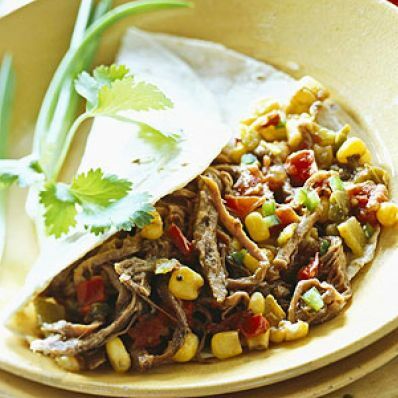 In this Mexican recipe, beef flank steak simmers slowly in a tomato sauce. When you're read to eat, shred the meat and return it to the sauce along with corn and chiles. Serve the whole mixture in warm tortillas. 1 of 7 Heat oil in large flameproof casserole or Dutch oven over medium heat. Add onion, red pepper, green pepper and garlic; cook until onion is translucent and peppers are softened, for about 8 minutes. 2 of 7 Stir in cumin and oregano; cook for about 1 minute. Add tomatoes and broth. 3 of 7 Season steak with salt and black pepper. Add steak to pot; cover and bring to simmering. Simmer about 2 hours or until meat is very tender, turning meat occasionally. 4 of 7 Remove meat; let cool briefly. Cut across grain into 2-inch-thick slices. Using two forks, pull slices apart into shreds. 5 of 7 Heat tomato sauce remaining in pot to rapid boiling. Continue to boil, stirring occasionally, until thick, about 10 to 15 minutes. 6 of 7 Add green chiles and corn. Heat to boiling; cook 5 minutes. 7 of 7 Add shredded beef, jalapeno and cilantro. Heat to boiling. Serve with warmed tortillas. Makes 8 servings.